Thousands of protesters have taken to the streets of Venezuela’s capital Caracas in support of President Nicolás Maduro – and his self-proclaimed interim successor Juan Guaidó. Mr Guaidó said the country’s opposition movement would “carry on in the streets”. Mr Maduro told supporters he was the only president of Venezuela. Mr Guaidó declared himself president last month and is backed by the US and several Latin American countries. Russia and China back President Maduro. The stand-off began days after Mr Maduro was sworn in for a second term, following disputed elections which many opposition leaders did not contest because they were in jail or boycotting them. Mr Guaidó, who is head of Venezuela’s National Assembly, says the constitution allows him to assume power temporarily when the president is deemed illegitimate. Addressing thousands of supporters in the capital Caracas, Mr Guaidó said protests would continue until his supporters achieved “freedom”. But a pro-Maduro crowd gathered to mark the 20th anniversary of the rise to power of his predecessor, the socialist leader Hugo Chávez. Mr Maduro accused international media of “making invisible” [not showing] demonstrations by pro-government supporters. 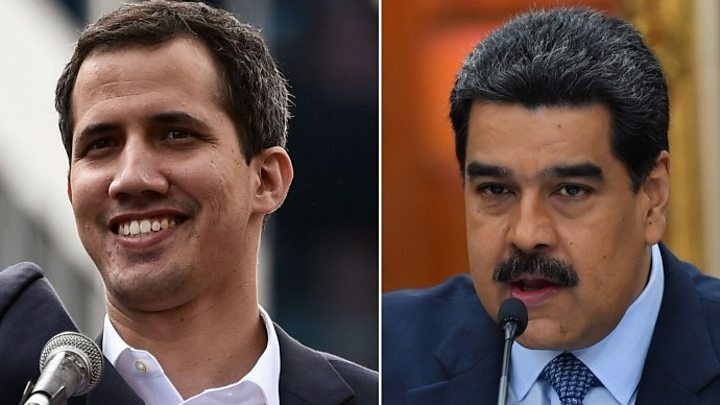 The rival protests come a day ahead of a deadline given to Mr Maduro by major European countries to announce new presidential elections – otherwise they would also recognise Mr Guaidó. Military support is seen as crucial to Mr Maduro’s hold on power. Many supporters at Saturday’s rally were seen wearing the khaki uniforms of the government militia. Ahead of the protests, a high-ranking Air Force general announced his support for Mr Guaidó in a video message posted online. Gen Francisco Yanez, the force’s head of strategic planning, called on other members of the military to join him in defecting. It is not clear when or where the message was recorded. In response, the Air Force’s high command accused him of treason. But US National Security Adviser John Bolton called on the rest of the country’s military to join forces with Gen Francisco Yanez. Mr Guaidó, meanwhile, says he has held secret meetings with the military to win support for ousting Mr Maduro. He has also reached out to China in the hope of improving relations with the country. In comments published in the South China Morning Post on Saturday, Mr Guaidó said he wanted a “productive and mutually beneficial” relationship with China, adding that he was ready to engage in dialogue “as soon as possible”. For the first time in years, Venezuela’s opposition feels optimistic. Tens of thousands of protesters gathered in the centre of the capital. They want to find a way of bringing about fall of the government they detest. Many have spent years living with shortages. Francia, a school teacher, told me that her mother had died because of a lack of medicine. “I have hope again,” she said. What did Mr Guaidó say on Saturday? “We are going to carry on in the streets until we achieve freedom and the end of the usurpation [of Maduro],” he told cheering crowds. He reiterated an appeal to the “civil and military officials” of Mr Maduro’s administration to back him. “Soldier of the nation… you have a role in the recovery of Venezuela,” he said. Mr Guaidó announced that the opposition would start gathering humanitarian aid from Colombia and Brazil and urged the military to let it into the country. Between 250,000 and 300,000 Venezuelans were “in danger” of dying due to food and medicine shortages, he added. What about Mr Maduro’s position? In a speech carried live by Venezuelan state TV, President Maduro insisted that his his left-wing revolutionary government would continue in power. “I am the sovereign president of all Venezuela,” he said, adding he retained the support of the military, who were “more loyal than ever” and calling on the opposition to give up a “failed” attempt to seize power. “Stop calling for war, stop supporting a coup that has already failed,” Maduro said. More than 20 countries, including the US, have recognised Mr Guaidó as Venezuela’s interim president. Last week, several European countries including Spain, Germany, France and the UK said they would also recognise Mr Guaidó as president if elections were not called within eight days.